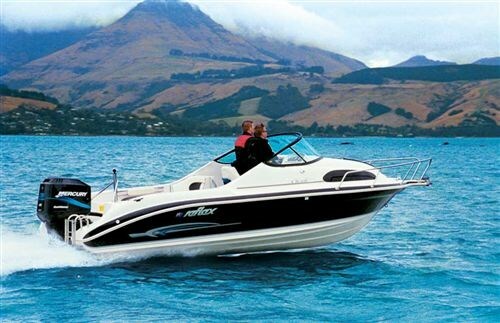 Reflex Products Ltd produced its first Chianti 615 in 2000 and since then the boat has proved to be a consistent seller offering versatility, stylish lines and quality construction in addition to good on water performance. Paul Smith reports. MacPherson Marine offered a Special Edition model of the Chianti 615 for review to mark its recent appointment as Christchurch dealer for Reflex Products Ltd. The Special Edition model differentiates itself from the standard 615 with black hull topsides accentuated by classy graphics, electric capstan, vee-berth infill, hydraulic steering and steering wheel upgrade. It also has King/Queen passenger seating, a stainless steel ski pole and boarding ladder, and cockpit lighting. The test boat was fitted with a Mercury 225hp EFI two-stroke outboard motor. The Chianti hull is formed in a hand-laid laminate to exacting specifications. A hull liner incorporating the stringers, floor bins and side braces is chemically bonded to the hull using a methacrylate adhesive that is actually stronger than the GRP laminate itself. The internal cavities are then filled with high density, closed cell polyurethane foam injected under high pressure (PuFF). The foam provides positive buoyancy, added strength and contributes to the very quiet ride. It’s a large volume boat for its size. The centre line length of the hull is 6.15 metres (hence the nomenclature), but overall length is seven metres when the bowsprit and portafino stern platforms are factored in. Combined with a generous 2.5m beam and comparatively high topsides, the boat certainly has presence. The deep vee hull form (20 degree deadrise at transom) features a long tapered delta keel section which is flanked by two planing strakes either side. The inside strakes finish about a metre short of the transom, while the outside ones on either side continue through the entire length of the hull. A wide, turned down double chine works with the strakes to provide plenty of lift and to deflect spray down and away from the hull sides. Overall, the style of the Chianti range reflects a blend of kiwi practicality with European curvaceousness and American glitz. The woodgrain inlay across the dash board and instrument surround combine with the full upholstery hint at American influences, while the roundness of the transom treatment and cabin top shapes are unashamedly European. Foredeck design incorporates a strong bowsprit with stainless steel fairlead and is flanked by a solidly-constructed stainless steel, split bowrail. The anchor locker top hinges to the side and is self draining. The SE version of the Chianti 615 has an electric capstan, making anchoring duties painless. While the bow rails provide security and there is sufficient foot space on the side decks to go for’d, if need be, the more likely access to the foredeck will be via the large hatch in the forecabin. The cabin itself is fully lined and the two full-length bunks can be converted to a spacious double berth by use of the infill supplied as standard equipment in the SE. A deep wraparound parcel tray is also fully lined and upholstered to match the bunks in a stylish neutral toned fabric. Natural light enters the cabin via the hatch and two sidelight windows. A 12-volt interior light illuminates the cabin at night. There is plenty of additional dry storage under the bunks. The Perspex wrap around windscreen has an upturned lip at the top which deflects air up and over the cockpit area. A strong grab rail follows the curve of the screen but below the top edge giving further protection to hands from the wind. The dash top has a large recess moulded in for storage of nik-naks and the helm station is on the traditional starboard side. Instruments are mounted in an imitation woodgrain binnacle and include engine coolant temperature, trim, tachometer, speedometer, fuel and hour clock. Beneath the instruments are two large flat spaces for installation of flush mounted electronic aids. The key-start ignition is mounted to starboard of the helm along with toggle switches for the bilge pump, navigation lights and cockpit lights. A compass is mounted on top of the dashboard in the centre. The soft riding pedestal mounted helm seat is adjustable both fore and aft as well as up and down and features a storage pocket in the back. Passenger seating to port is by a King/Queen back to back unit on a moulded GRP base. The front seat tilts forward to expose cavernous dry storage in the base. 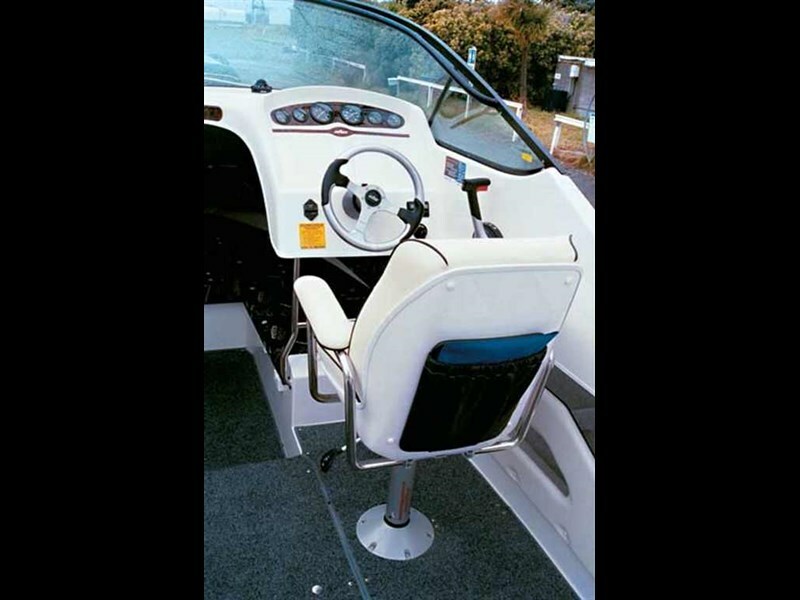 Two further seats are moulded into the transom either side of the engine well and these bases can be easily removed to provide greater standing space for fishing or monitoring waterskiers. The cockpit is spacious and uncluttered. 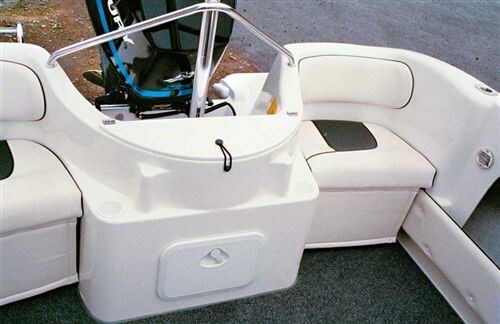 There are lined, multilevel, full-length side pockets along each side and stainless steel grab rails placed strategically to assist with moving about even in rough water. A large underfloor locker is accessed from a hatch between the seats and the 180-litre stainless steel fuel tank is also mounted under the cockpit floor just ahead of the transom. The engine well has a locker built into the top which could be used for a rope locker or live bait tank depending upon the owners preferences. Beneath this locker is an in-built tackle box secured by a SoPac hatch. A triangulated stainless steel ski pole completes the picture. The portofino style stern incorporates boarding platforms either side of the engine with the starboard side including a sturdy stainless steel boarding ladder. There are four stainless steel rod holders built into the cockpit coamings – two per side- in addition to the mount for the pole light. Another nice feature was dual stainless grab rails along the inside cockpit coamings which had padded thigh rests attached at perfect fishing height. The Chianti 615 SE provided by MacPherson Marine for evaluation had been fitted with a Mercury 225hp EFI two-stroke outboard engine. The three-litre V6 engine starts easily and runs quietly with little or no "blue smoke" visible. Although the Chianti 615 SE is rated for engines 130 – 200hp, the relatively light (218kg) Mercury 225hp EFI in no way overwhelmed the boat. On the day of our water trials, Lyttleton Harbour failed to provide any conditions that might have challenged the sea-keeping capability of the Chianti 615 SE. A steady southerly inspired a half-metre wind chop but no matter how hard we pushed the Chianti 615 SE before, into or across the chop not a drop of spray found its way on to the windscreen. The boat responded quite well to inputs from the Sea Star hydraulic steering and to trimming of the outboard. In the conditions we experienced there was no need for trim tabs that are an extra cost option. With three bodies and half a tank of fuel, the Chianti 615 SE was quick to plane with modest throttle openings and would hold a clean plane at just 2500rpm and 30kph showing on the GPS. 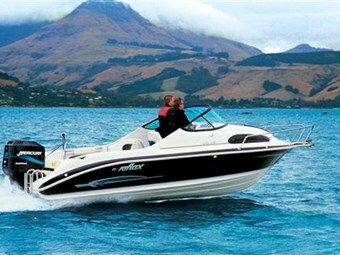 This makes the boat ideal for towing youngsters on water toys, or negotiating heavy sea conditions at slow speed. A long-legged relaxed cruise speed was generated at between 3500rpm and 4000rpm with boat speed measured at 56kph (3500rpm) and 67kph (4000rpm). The engine had been fitted with a stainless steel 21" Mirage propeller that held the motor to 5500rpm at Wide Open Throttle and 92kph indicated on our hand-held GPS. The Chianti 615 SE immediately impressed with its quiet ride and solid feel on the water with no annoying rattles or squeaks. There was a satisfying surge forward as the throttle was opened from 3500rpm highlighting the two-stroke grunt from the big Merc, but unless you are in a desperate hurry to get somewhere in particular and therefore prepared to pay the price of the Merc’s healthy thirst for fuel at wide open throttle, my suggestion would be that you enjoy the relaxed, comfortable feel of the boat at cruising speed. The boat is supplied on a galvanized steel Mudgeway tandem axle, multi-roller trailer fitted with override hydraulic disc brakes on the front axle. The cutaway rear rib design makes for easy launching and retrieval. With a towing weight of around 1700kg, the boat need not be a daunting towing proposition. 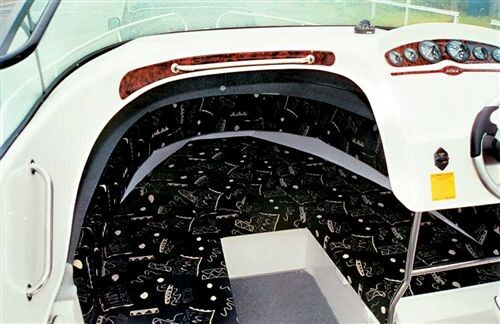 The list of options can include such things as a bimini cover, rocket launcher and trim tabs, as well as a comprehensive electronics package. The Chianti 615 SE is an excellent all round platform from which to build a versatile and comfortable trailer boat. Specifications Reflex Chianti 615 SE (Price as reviewed: $76,950 inc GST. Basic model from $59,950 inc GST). Construction GRP, hand laid, integrated hull/deck cabin insert, high density foam injected.